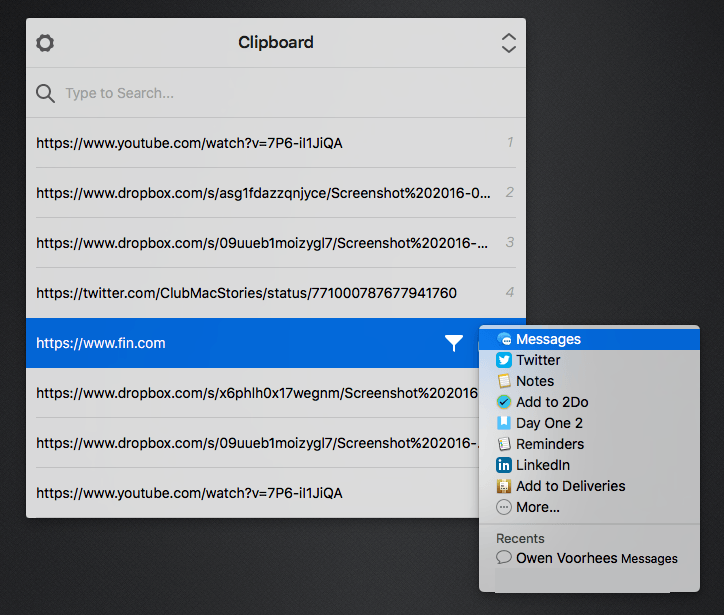 You may remember Pastebot as an early iOS clipboard manager. That app is no longer available, but Tapbots has brought Pastebot back in the form of a macOS app. 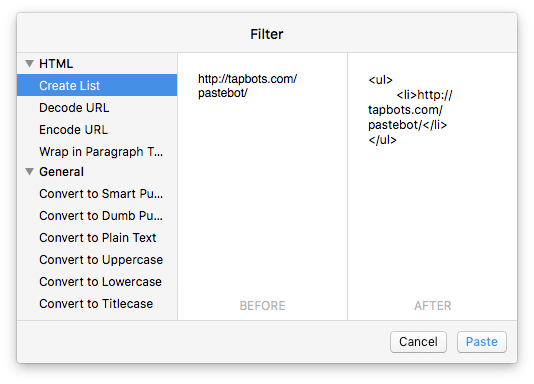 Pastebot for Mac can store up to 500 of your most recently copied items, including text, URLs, images, and files. The clips are stored chronologically with the most recent ones on top. That makes finding recent clips easy, but even older clips that are buried under recent items aren't hard to find thanks to Pastebot's smart search functionality. In addition, you can save frequently used clips to custom pasteboards and manipulate clips with filters. We have been wanting to do a full blown Pastebot for Mac long before we first released it on the iPhone. Paul wrote a fantastic little utility app called PTH Pasteboard Pro on the Mac which I had always wanted to rewrite as a Tapbots app, but we were just too busy with iOS. After the release of Tweetbot 2 for Mac, it only made sense to have Todd start on Pastebot for his next big project. 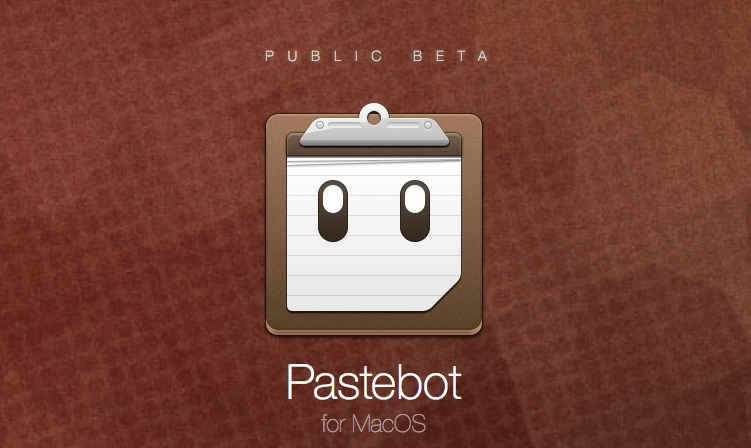 So we are very excited to release Pastebot for Mac…as a public beta. I have been testing Pastebot for Mac for several weeks and it’s got some great features like the ability to create custom filters that allow you to transform clipped text in various ways. If you are interested in joining the public beta, head on over to tapbots.com/pastebot. There have only been two great Twitter apps for iPad since 2010: Loren Brichter's Twitter, and the original Tweetbot for iPad. As I reminisced last year in my look at the state of Twitter clients, iOS apps for Twitter are no longer the welcoming, crowded design playground they once were. Developing a Twitter client used to be an exercise in taste and restraint – a test for designers and developers who sought to combine the complex networking of Twitter with a minimalist, nimble approach best suited for a smartphone. Twitter reclaimed their keys to the playground when they began offering "guidance" on the "best opportunities" available to third-party developers. Four years into that shift, no major change appears to be in sight. For this reason, I'd argue that while the iPhone witnessed the rise of dozens of great Twitter clients in their heyday, the iPad's 2010 debut played against its chances to receive an equal number of Twitter apps specifically and tastefully designed for the device. Less than a year after the original iPad's launch (and the Tweetie acquisition), Twitter advised developers to stop building clients that replicated the core Twitter experience; a year later, they started enforcing the 100,000-token limit that drove some developers out of business. Not exactly the best conditions to create a Twitter client for a brand new platform. Largely because of the economic realities of Twitter clients, few developers ever invested in a Twitter app for iPad that wasn't a cost-effective adaptation of its iPhone counterpart. Many took the easy route, scaling up their iPhone interfaces to fit a larger screen with no meaningful alteration to take advantage of new possibilities. Functionally, that was mostly okay, and to this day some very good Twitter apps for iPad still resemble their iPhone versions. And yet, I've always felt like most companies had ever nailed Twitter clients for a 10-inch multitouch display. With two exceptions. The original Twitter for iPad, developed by Tweetie creator and pull-to-refresh inventor Loren Brichter, showed a company at the top of their iOS game, with a unique reinterpretation of Twitter for the iPad's canvas. The app employed swipes and taps for material interactions that treated the timeline as a stack of cards, with panels you could open and move around to peek at different sets of information. I was in love with the app, and I still think it goes down in software history as one of the finest examples of iPad app design. Until Twitter ruined it and sucked all the genius out of it, the original Twitter for iPad was a true iPad app. And then came Tweetbot. While Twitter stalled innovation in their iPad app, Tapbots doubled down and brought everything that power users appreciated in Tweetbot for iPhone and reimagined it for the iPad. The result was a powerful Twitter client that wasn't afraid to experiment with the big screen: Tweetbot for iPad featured a flexible sidebar for different orientations, tabs in profile views, popovers, and other thoughtful touches that showed how an iPhone client could be reshaped in the transition to the tablet. Tapbots could have done more, but Tweetbot for iPad raised the bar for Twitter clients for iPad in early 2012. Three years later, that bar's still there, a bit dusty and lonely, pondering a sad state of affairs. Tweetbot is no longer the champion of Twitter clients for iPad, having skipped an entire generation of iOS design and new Twitter features. Tweetbot for iPad is, effectively, two years behind other apps on iOS, which, due to how things turned out at Twitter, haven't been able to do much anyway. On the other hand, Twitter for iPad – long ignored by the company – has emerged again with a stretched-up iPhone layout presented in the name of "consistency". It's a grim landscape, devoid of the excitement and curiosity that surrounded Twitter clients five years ago. 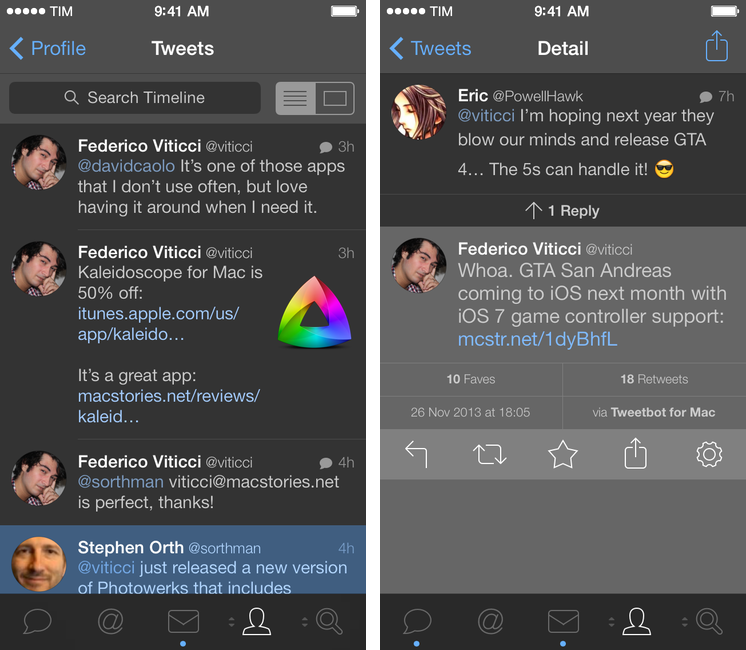 Tweetbot 4 wants to bring that excitement back. Long overdue and launching today on the App Store at $4.99 (regular price will be $9.99), Tweetbot 4 is a Universal app that builds upon the foundation of Tweetbot 3 for iPhone with several refinements and welcome additions. 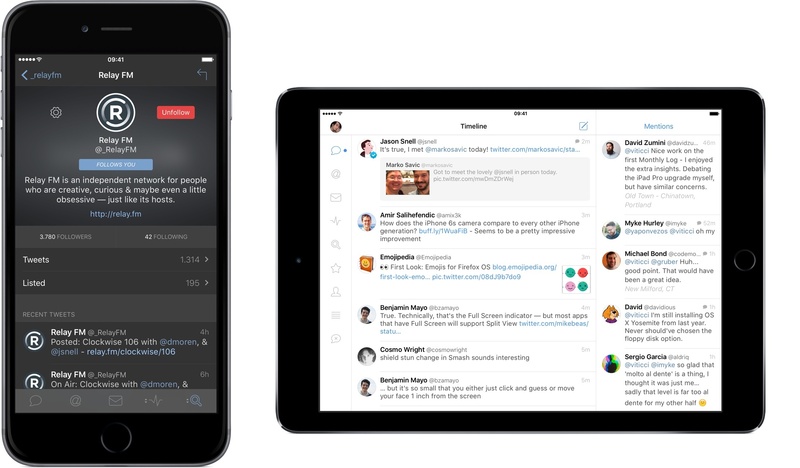 In the process, Tweetbot 4 offers a dramatic overhaul of the iPad app, bringing a new vision for a Twitter client that's unlike anything I've tried on the iPad before. Welcome to the new tapbots.com! We hope this long overdue refresh is a better place to stay up to date with our apps. Our goal this year is to not only ship updates on a more regular basis, but also provide more insight into what we are currently working on. So lets get on to the important bits of information. With the refresh, Tapbots has pulled Convertbot from the App Store (its core functionality is built into the newly released Calcbot 2), removed Pastebot, and set Weightbot free. On the homepage, Tapbots confirms that a major update to Tweetbot for iOS (version 4.0) is in the works with iPad and landscape support, a redesigned profile view, and more. Tweetbot 3.0 was a fantastic take on Tapbots' Twitter client (and it stacks up well to other Twitter apps on iOS) and, between this and Tweetbot for Yosemite, I'm excited to see more Tapbots software in 2015. Tapbots have today launched a Mac version of their Calcbot app. Priced at $4.99, Calcbot for Mac is a good replacement for the default OS X calculator if you want a calculator with a few more bells and whistles but don't necessarily need something as advanced as PCalc. Calcbot comes with a Basic and Scientific calculator, as well as an in-built unit converter. Tweetbot for Mac, Tapbots' desktop version of its popular Twitter client, was updated last night with support for a new large thumbnail option in the timeline, a refreshed design of inline image previews, and a fix for three-finger gestures. Following Tweetbot 3.3 for iPhone, Tweetbot 1.5 for Mac adds large thumbnails as an option in the app's Preferences. Large thumbnails retain the capability of being right-clicked to access a contextual menu, and they bring a slightly redesigned preview in the tweet detail view as well. In my tests, loading large thumbnails with proper resolution required deleting Tweetbot's account cache under Preferences > Account. For users who enabled three-finger navigation gestures on their Macs, Tweetbot will now respect that setting and allow to swipe with three fingers to navigate back and forth between tweets, timelines, and other views of the app. 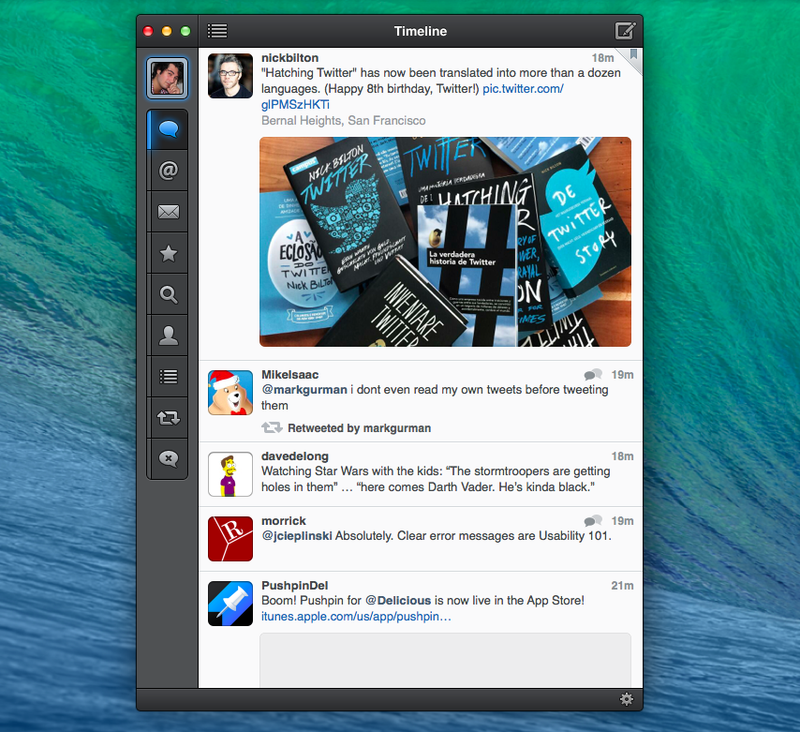 Tweetbot for Mac is available at $19.99 on the Mac App Store. You can read our original review here. Tweetbot, Tapbots' Twitter client for iPhone that was relaunched in October for iOS 7, has been updated today with new display options and the possibility to remove tweets that match a filter. For the past few months, Tapbots has been working on improvements to Tweetbot's presentation and text size controls, adding new settings in version 3.1 and a night theme in 3.2 alongside additions to account management and reordering. In today's update, Tweetbot gets a new font option in the Preferences to enable Avenir as the app's primary typeface, as well as a new setting to enlarge thumbnails in the timeline. The latter makes Tweetbot more akin to the official Twitter app for iPhone in that it displays large photos (and app icon previews for iTunes links) that give a better idea of a media item inline without having to show the tweet detail view. Just like Tweetbot for Mac, Tweetbot for iPhone can now remove tweets that match a mute filter as soon as the filter is added. 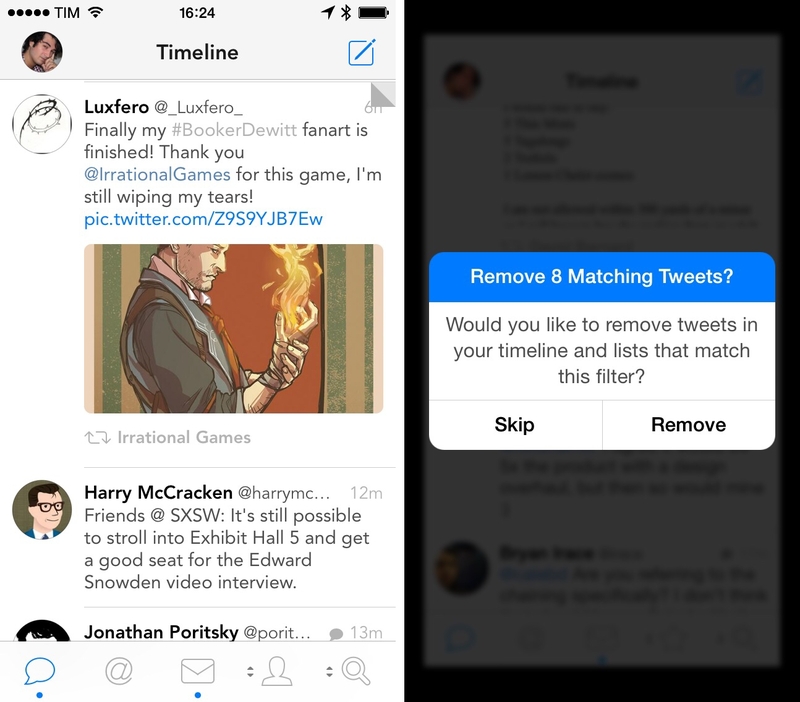 Through a dialog box, the app will offer to remove matching tweets that have already been loaded in the timeline. The option is particularly welcome if you, for instance, wake up in the morning and realize you don't want to scroll through hundreds of tweets about an event that happened overnight. 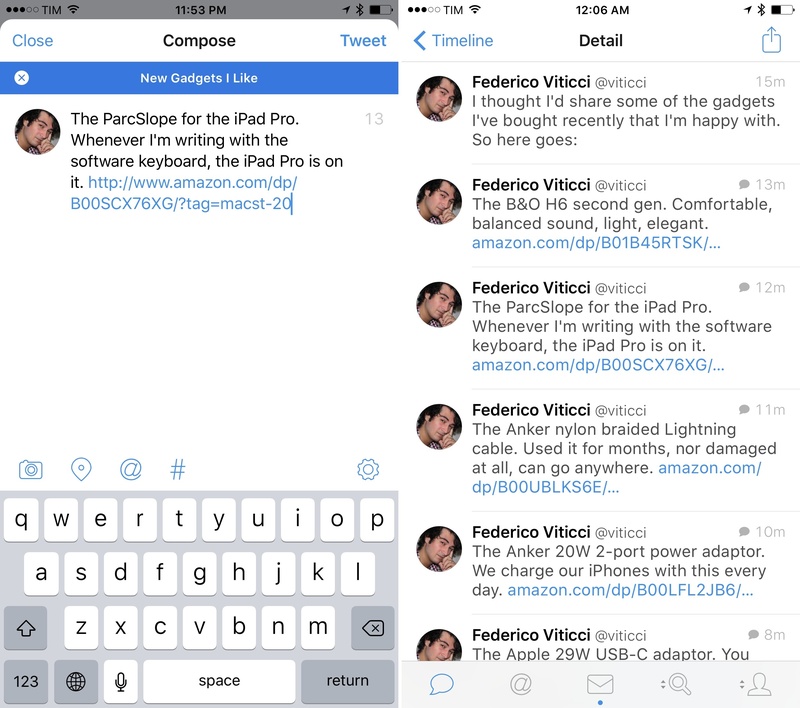 Tweetbot 3.3 further refines Tapbots' vision for Tweetbot 3 on the iPhone, and it's available now on the App Store.